The Hunter Fan Company is a well-known and reputable ceiling fan manufacturer who produces high quality and efficient ceiling fans at an affordable cost. The ceiling fans undergo extreme testing so as to ensure they conform to some specific standards and meet public demand. Hunter ceiling fans are designed to offer all of the high-end features you crave for in a fan at budget-friendly rates. Keeping up with the latest development in technology, Hunter Fan Company has incorporated a mechanism which allows their fans to produce ultra-powerful airflow with a whisper-quiet performance to offer a wobble free and comfortable experience in their ceiling fans called WhisperWind technology. This technology also ensures powerful air circulation at reduced energy cost, which put them as the foremost manufacturers of ceiling fans in terms of energy efficiency, top-quality speed and comfortability. Hunter ceiling fans come with ENERGY STAR certification for efficient airflow and optimal air circulation. Hunter ceiling fans are not restricted to indoor use alone, some are ETL damp-rated for outdoor mounting, creating a versatile ceiling fan. With these ceiling fans, you can rest assured of a sharp cut in utility bills without sacrificing speed performance, plus they are environmentally friendly. Below is a Hunter fan review list of top quality, energy efficient, top-notch performance and powerfully built units. These units have everything you want in a fan at an affordable price. Survey through the list and pick the Hunter ceiling fan that caters for your needs and budget. As a company known to deliver beautiful and classy ceiling fans using high-quality materials, the Hunter Fan Company did not fall below expectations with the Builder Deluxe. The ceiling fan comes with stylish designs which will give an added expression to any home décor. Also, the fan is both energy efficient – produces maximum air circulation at minimum energy consumption – and affordable by anybody. The Builder Deluxe is a state of the art ceiling fan which comes with all the needed features of a fan. Its motor is capable of generating 5110 cubic feet per minute airflow rate at a very silent precision, due to the Hunter’s WhisperWind technology. The technology gives the ceiling fan the ability to produce powerful and wobble free airflow in the room, providing a comfortable breezing wind-effect with zero disturbance. 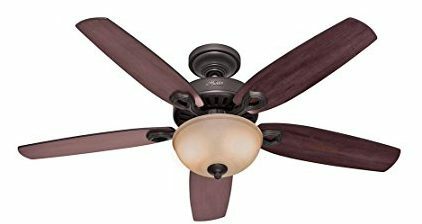 This Hunter brand ceiling fan also comes with a removable light kit which consists of a toffee glass bowl and 2 x 60w light bulbs, which can be found in the fan packaging. The fan has no handheld remote control, but for comfortability, you can purchase a universal remote control. There is a pull-chain with which you can switch on/off the light and control the speed settings of the fan. A lifetime motor warranty and one-year warranty on all defective parts are provided by the Hunter Company. 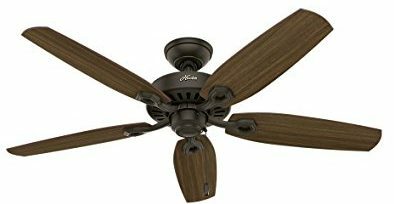 This Hunter ceiling fan features five high-quality blades of proportional sizes coupled with a motor delivers 5160 CFM of comfortable air circulation. The fan comes with the Hunter’s Whisper Wind Motor technology. It works well in both oscillating directions – clockwise and anticlockwise – offering cool air all year round. The ceiling fan is energy efficient with the downdraft and updraft features for both summer and winter respectively to cut energy cost. Included with the fan is a light kit which that consists of a white glass bowl that takes 2 x 60W light bulbs. In place of a remote control is a pull-chain for controlling both the light and the fan speed levels. As usual, you can easily purchase a universal remote to operate the ceiling fan with ease. 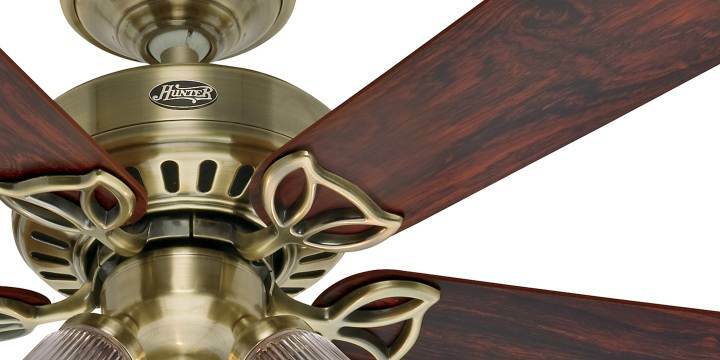 The unit comes in three different styles – brushed nickel, new bronze and snow white texture – which sports the same motor and number of blades. Also included in the fan packaging is a standard 6 inches downrod and 5-inch rod. This Hunter ceiling fan unit comes with a one-year warranty on parts and a lifetime warranty on the fan motor. The fan is relatively easy to mount and clean. This is an elegantly designed Hunter ceiling fan which features five high-quality reversible blades connected to a powerful motor capable of producing up to 5049 CFM of air circulation in the room. The reversible blades are available in both mahogany and cherry color with four different design options – brushed nickel/Brazilian cherry, black matte, and new bronze/harvest mahogany – based on user preferences. The motor comes with WhisperWind technology to deliver silent precision at its highest speed setting. This Hunter ceiling fan is designed to work throughout the year with its ability to oscillate both in directions, for summer and winter. Like the other Hunter ceiling fan units, the Builder Elite has three speed levels – low, medium and high. Included in the ceiling fan packaging is two downrods for easy standard, flush and angled mounting, but there is no light kit and remote control. The light kit can be easily purchased at an affordable price, plus there is a pull-chain to control the ceiling fan speed setting. If you are not comfortable with that, you can purchase a universal hand-held remote control at an extra price. 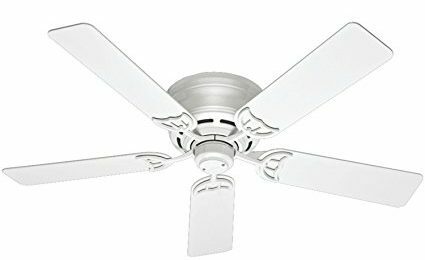 This Hunter brand ceiling fan unit is certified energy efficient allowing you to use the fan at its highest speed setting without expending much electric power. The ceiling fan comes with a lifetime motor warranty plus one-year warranty on all defective parts. The Builder Elite is a premium and high-quality alternative for an energy efficient fan that works at top speed with zero disturbance and has no light kit. This Hunter ceiling fan comes with five reversible 54-inch blades attached to a highly effective and powerful motor which is capable of generating 5803 CFM airflow rate. This Hunter ceiling fan unit is designed to efficiently circulate air in a large room of up to 485 square feet. The five blades come in two elegant style – antique dark palm leaf and antique dark wicker with a Provencal gold finish – to complement any home décor. The WhisperWind motor produces ultra-powerful airflow with a whisper-quiet performance to offer a wobble free and comfortable experience all through its three-speed levels – low, medium and high. The 13-degree blade pitch offers optimized air movement and peak performance.This Hunter ceiling fan is designed to function throughout the year, with a reversible mode that allows the fan to oscillate in both directions – anticlockwise and clockwise – for comfortable airflow during summer and winter. This Hunter ceiling fan unit is built for outdoor use and has an ETL damp-rating which allows it to be mounted in covered porches, patios, and sunrooms. The ceiling fan comes with a light kit which can be easily mounted and removed for a light-free ceiling fan. It also comes with a 3 inches and 2 inches downrods, but you can purchase a longer downrod if you have a high ceiling. Like all Hunter ceiling fans, the palm leaf is very easy to install and can be self-mounted. There is installer’s choice of a standard, flush or angled mounting. Included is a pull-chain to operate the fan and turn on/off the light kit. But you can easily purchase a universal remote for added comfort. This Hunter ceiling fan is ENERGY STAR certified for superior energy efficiency at maximum speed. It comes with a lifetime motor warranty and 1-year warranty on all pieces. 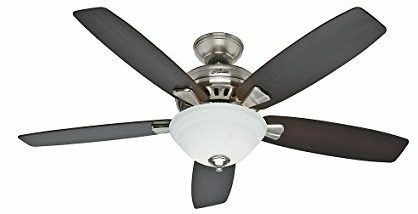 This fan comes with a beast of a motor and huge 60-inch blade span that sport 5 blades of top quality. The motor and blades are able to produce up to 7185 cubic feet per minute airflow at maximum speed. Despite this great feat, it is almost as silent as a graveyard at its top speed. It is one of the most efficient and powerful Hunter fans out there. The Valerian ceiling fan is capable of oscillating anticlockwise to circulate cool air from the floor up during summer, and clockwise to circulate warm air from the ceiling down. The ceiling fan is no different from every other Hunter fan in terms of installation. Also packaged with the fan is an 8 inches downrod which may not be the right length you need, but you can easily purchase the proper down-rod at an extra cost. The fan has a pull-chain with which you can control the speed of the fan and switch off/on the light. If you are not comfortable with the pull-chain, you can buy a universal remote as a replacement. This is a stylishly designed ceiling fan which offers high-quality airflow at a reduced energy cost. It is foremost among flush-mounted ceiling fans with the capacity to keep large rooms of up to 485 square feet cool all through. It features a lengthy stylish five blades of 52 inches, attached to a powerfully built motor which produces up to 2852 CFM air flow rate with an efficient airflow at 44 cubic feet per minute per watt. With this, comfortable air circulation is guaranteed all year round. 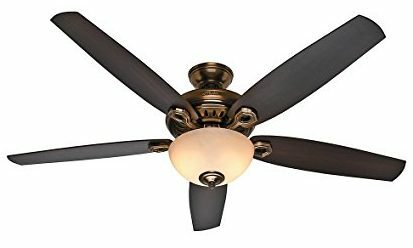 The ceiling fan comes with three different speed settings – low, medium and high, and according to the manufacturer, the fan can still provide wobble-free and silent performance at the highest speed setting. It can operate both in the anticlockwise and clockwise direction, making it an all-season ceiling fan. This unit does not feature a light kit or come with a remote control, but both problems can be easily solved by purchasing a universal remote and mounting a light kit (if needed). The fan is very affordable and comes in varieties of awesome designs to fit in with the décor of any home. There is a 1-year warranty on the fan components plus a guaranty on the life of the motor by the manufacturer. This is a Hunter ceiling fan which is built for power and efficiency. It comes with a whopping 96 inches 6 sets of fresh white aluminium blades coupled with a beast of an engine which is capable of turning at 58 RPM and can generate a massive 11,899 cubic feet per minute air flow at highest speed. This Hunter industrial ceiling fan is designed for efficient air circulation in large spaces like vaulted living rooms, industrial buildings and pole barns. Like most Hunter ceiling fan, the 96-inch industrial ceiling fan also comes with a reversible mode. It allows you to switch to downdraft for summer and updraft for winter, which helps to reduce the expenses spent on utility bills. The motor also comes with Hunter’s WhisperWind technology that offers ultra-powerful air movement with wobble-free and silent performance. This Hunter ceiling fan is also designed for outdoor mounting and it is ETL Damp-rated for use in patios, sunrooms and covered porches. The ceiling fan comes with a light kit which can be easily mounted and removed for a light-free ceiling fan. It has no remote control or pull-chain function, but it comes with a standard switch box with which you can operate the light kit and the three-speed levels that include low, medium and high settings. Also, the package includes everything you need to mount the fan. Unlike the other ceiling fan, the Hunter Fan Company provides a 15-year limited warranty on all parts. 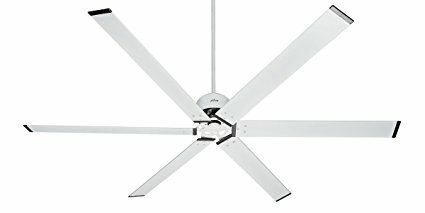 This Hunter fan review has revealed 7 of the best Hunter products in all its glory, and as stated earlier, Hunter Fan Company is reputable ceiling fan manufacturer and they deliver on every product feature they promised, with a lifetime warranty on motor and one-year warranty on parts as a guarantee to their commitment. 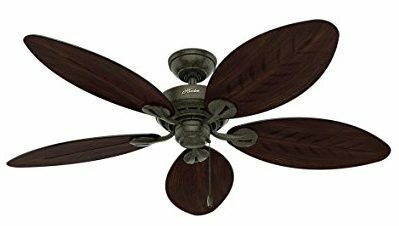 Hunter ceiling fan blades are made of the finest quality material with a beast of a motor for a cool and comfortable air circulation throughout the year. Plus, all Hunter fan blades come in different exquisite design to give an added classic effect to your home décor.